The tragic, senseless and deliberate drowning of 300 rare birds by wildlife traffickers when pursued by the authorities (Wed, 17 Jan 2018) evinces the cruel and destructive nature of the exotic pet trade. The birds were drowned because they were merely merchandise and not sentient living beings to the traffickers, and when pursued, the birds became a liability and possible evidence in the event of arrest. Birds are especially vulnerable to poaching and trafficking because of their abiding popularity as pets. Birds, especially parrots, are sedated and have their beaks cut or taped up, legs bound and wings clipped or tied by wildlife traffickers. The Animal Law Coalition reports that 60 percent of wild-caught birds do not survive to reach their destinations. Most die of shock, stress, illness and injury during capture, transportation, transit and captivity. Readers who expressed sorrow at the needless deaths of the birds must realise that such incidents are not uncommon, and Malaysia is not merely a stopover for wildlife traffickers who are non-Malaysian citizens. Malaysia is known to be a hub for wildlife trafficking and the illegal wildlife trade despite the existence of the Wildlife Conservation Act 2010 and Animal Welfare Act 2015. There are very few regulations in place making it difficult for people to purchase, acquire, or keep exotic animals, especially when proper licenses have been obtained. 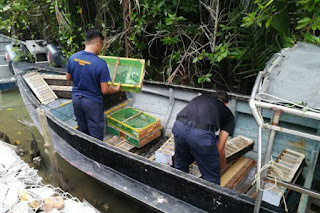 Environmental organisations including TRAFFIC and the International Fund for Animal Welfare (IFAW) confirm the existence of a flourishing trade in live animals and endangered species in Malaysia, and social media is a virtual wildlife supermarket offering everything from Common Hill Mynas to trapdoor spiders and sun bear cubs. The international wildlife trade involves a multi-million dollar organised crime network. The Wildlife Conservation Society reports that the wildlife trade, which is valued to be approximately US$8 billion annually, is surpassed in scale only by the illegal trade in drugs and arms. Government agencies are no match for wildlife poachers and traffickers. Corruption, porous borders, and a lack of resources and manpower make it difficult for many developing countries to stop the illegal wildlife trade. Yet stamping out the wildlife trade cannot be the responsibility of governments and law enforcement agencies alone. It is not them who are driving up the demand for exotic pets, but consumers who treat exotic pets as status symbols, social media users who upload and share posts featuring captive wildlife and exotic pets, and tourists who pay money to have photo opportunities with exotic pets and drugged wildlife. Many people who defend their ‘right’ to purchase and keep wild birds and other exotic pets hang on to the misguided belief that the animals are safer in their care now that rainforests and other wildlife habitats have been destroyed, or that there is virtually no difference between keeping wildlife and keeping dogs, cats and other domestic animals as companion animals. However, we must remember that the wildlife trade is a major threat to biodiversity, ecosystems and even human health and safety. Birds, especially parrots, can spread parrot fever and pneumonia, especially through the inhalation of their dry droppings in a cage or aviary. Keeping wild animals indoors confined to small tanks, cages and enclosures, away from members of their own species, is neither educational nor compassionate. Many exotic pets often end up being released, surrendered to zoos, abandoned or unintentionally killed due to ignorance and neglect. Many exotic species advertised as ‘captive bred’ are actually poached from the wild, since DNA testing cannot reveal whether an animal was raised in captivity or in the wild. If the report of the drowned birds had saddened us, then it must also move us into action. We cannot continue normalising the practice of poaching, abusing, exploiting and confining wildlife. We need to question if our purchases and choices destroy habitats and the ability of rural and indigenous communities to sustain themselves, thus driving them to poach wildlife for a living. We need to refrain from taking photos with wildlife, sharing wildlife selfies on social media, and allowing circuses and badly-kept zoos to profit from exploiting wildlife. Nature-lovers who enjoy watching and photographing wildlife must take extra care not to disclose the location of endangered species and birds’ nests. We need to advise friends and family against purchasing or acquiring exotic pets, and persuade them to adopt from local animal shelters or to visit and support sanctuaries and rescue organisations instead. We need to avoid shopping at pet stores that sell exotic pets, and should lodge reports on the sales of wildlife to Perhilitan or wildlife conservation groups that can assist in investigating and acting on our reports. Those who intend to report wildlife crime must be vigilant and relay accurate information, such as the species, location, photographic and documentary evidence and contact information, to Perhilitan’s official website or through their Careline at 1300-80-10-10, or to the 24-hour NGO-run Wildlife Crime Hotline at 019 356 4194. Birds in their natural habitat are not only beautiful to observe, but have an important ecological role to play. Birds pollinate plants, disperse seeds and keep insect and other disease vector populations down. The exotic pet trade is driving many wild bird species to extinction, and this can have a knock-on effect on other species and result in ecological imbalance. There has to be a worldwide import ban on the bird trade to stop bird species from being poached and trafficked to extinction, and at the same time, more needs to be done to reduce the domestic demand for keeping wild birds as pets as well. It would do well for us to think of the excruciating yet avoidable deaths of the drowned birds before we purchase birds as pets or upload a wildlife selfie.